"During the years 1914-1923, whilst the attention of the international community focused on the turmoil and aftermath of the First World War, the indigenous Greek minority of the Ottoman Empire, the Republic of Turkey's predecessor, was subjected to a centrally-organized, premeditated and systematic policy of annihilation. This genocide, orchestrated to ensure an irreversible end to the collective existence of Turkey's Greek population, was perpetrated by two consecutive governments; the Committee for Union and Progress, better known as the Young Turks, and the nationalist Kemalists led by Mustafa Kemal "Atatürk". A lethal combination of internal deportations involving death marches and massacres conducted throughout Ottoman Turkey resulted in the death of one million Ottoman Greeks. 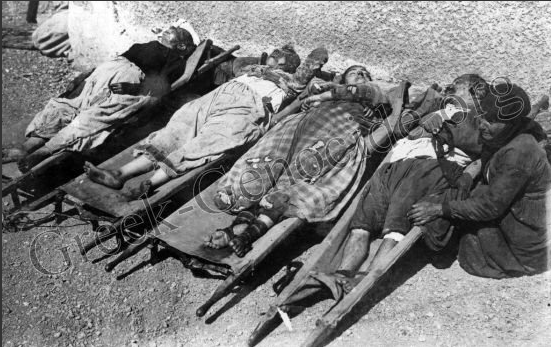 The International Association of Genocide Scholars, an organization of the world’s foremost experts on genocide, have affirmed the Ottoman Greek Genocide." - Feature Stories: "Near East Relief on Ottoman Greeks", "Perpetrators of the Ottoman Greek Genocide", "Ambassador Morgenthau's Story", "Mass Grave Discovered in Samsun, Turkey", "Armenian Genocide", "Patriarchate Figures on the Deportation of Ottoman Greeks", "1,500,000 Greek Christians Massacred or Deported by Turks", Massacre of the Greeks in Turkey", "Treaty of Servres", "Nikos Mastoropoulos", "Mustafa Kemal: 1926 Los Angeles Examiner".